In its short history, Tapbots has released two incredibly well-designed utilities for the iPhone: Weightbot & Convertbot. Last night they launched their third – and in my opinion, it’s the best bot yet. 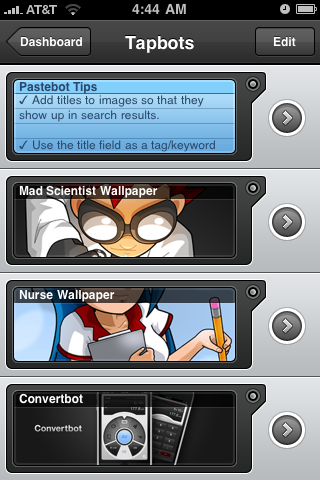 Pastebot is the ultimate clipboard manager for the iPhone or iPod touch. I’ve been lucky enough to use this app for a few months. When I first started using it I described it as “an app I didn’t know I needed, but can’t imagine not having it“. It’s beautifully designed. It’s incredibly easy to use: simply copy an image or text string within any iPhone app, then launch Pastebot and – bickety bam! – it’s stored to Pastebot’s clipboard. Once you’re in the app, you can easily toggle between multiple clips. If you’re a neat freak, you can easily setup a series of folders. If you use Tapbots to store images, you’ll be able to crop and apply color effects to stored images. I could go on and show you lots of screenshots and walk you through all of the apps features, but I won’t. Instead, I encourage you to visit http://tapbots.com/pastebot/ to learn more, or hop on over to iTunes and grab a copy. (It’s only $1.99 for now. The price will go up to $2.99 after the initial launch.) Oh, and did I mention it’ll sync to your Mac? Want to win a copy of Pastebot? In the comments below, tell me what you might use Pastebot for. I’ll announce the winner tomorrow – 12/16/09. Leave a comment before 12/16/09 at 9:00am EST to be included in the drawing.